These are the real deal brownies. The ones you dream about. Classic, fudgy and oh so chocolately. They mix up in the snap and the recipe makes enough for sharing. Though I’m pretty greedy so I’ve been known to keep them all for myself and make an extra batch for a friend. The instant espresso powder “is almost imperceptible, but its presence gives the chocolate flavour a turbocharge,” according to Dorie Greenspan in her Baking cookbook. And because I’m a salty sweet addict I pump up the salt to 1/2 a teaspoon. But you can dial it back to your own taste. These are so sweet, salty, fudgy and nutty that they don’t need icing. I would start with one and see how you feel. Two might be overkill. Centre a rack in the oven and preheat to 325 degrees F. Line an 8-inch square baking pan with parchment or foil. If using foil, butter it. A kitchen towel wrapped around the bowl will prevent water from getting into the mixture. Set a heatproof bowl over a saucepan of simmering water. 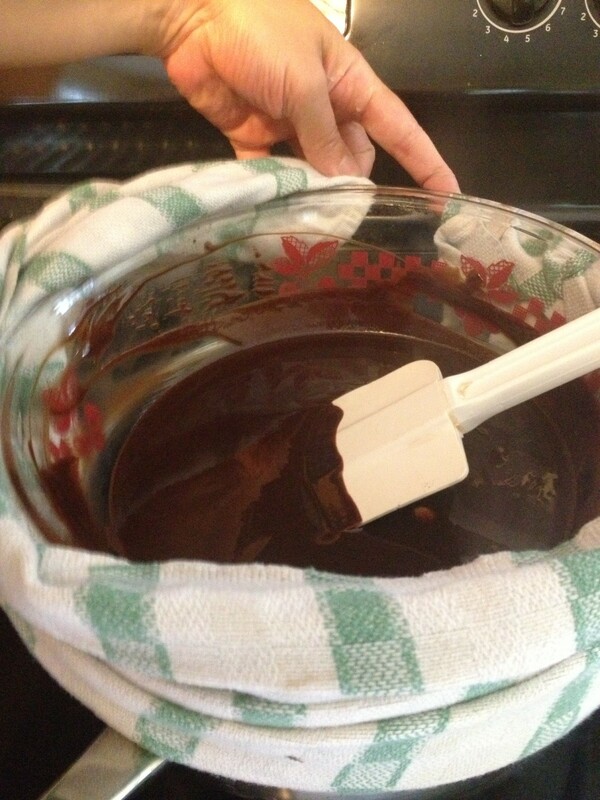 Put the butter in the bowl, top with chopped chocolates and stir occasionally until the mixture is just melted. Don’t let it get too hot or the butter will separate. Make sure not to get any water into the bowl or the chocolate might seize. You can tie a large kitchen cloth as a bib around the lip of the bowl to ensure no moisture accidentally drips into the chocolate/butter mixture. Remove thebowl from the pan of water. With a whisk stir in sugar. Don’t worry when the smooth mixture turns grainy. One by one, quickly mix in the eggs. Add the vanilla and give the mixture a vigorous whisking before gently stirring in the espresso powder, if you are using it. Also gently stir in the flour and salt. Stir only until incorporated. Switch to a rubber spatula and fold in chopped walnuts. Bake for 30 to 35 minutes, or until top is dull and a thin knife inserted into the centre comes out clean. Transfer pan to rack and cool to room temperature. When the brownies are cooled you can invert them onto a rack, peel away parchment or foil and turn them right side up onto a cutting board. Cut into 16 squares and trim the borders a scant 2 inches on each side if you’re super meticulous. Of if you’re like me and enjoy the crispy edges, do not trim. Yum! 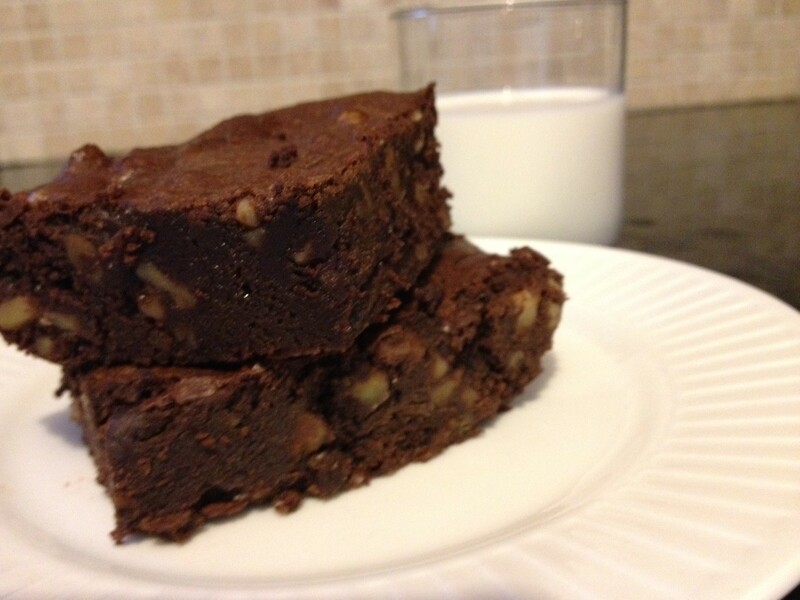 This entry was posted in Sweet, Uncategorized and tagged Brownies, Butter, Chocolate, Chocolate brownie, Classic brownies, Dorie Greenspan, Easy brownies, Walnut brownies. Bookmark the permalink.